This soup is kind of a mutt, but I love it anyway (mutts tend to be lovable, don't they?). 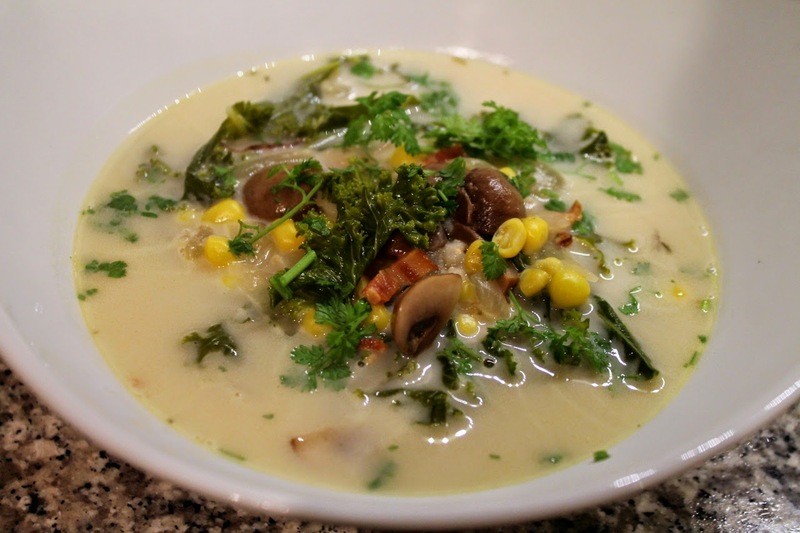 In making it, I thought a little bit about corn chowder and tom kha tai soup, although the resulting product doesn't really resemble either. It's a nice blend of earthy and fresh flavors, well suited for these waning days of spring and summer starts to really hit. Besides bringing together all these great flavors, I wanted a soup that would be a good vehicle for chervil from my herb garden. Chervil looks a lot like parsley, and I've read they are related, although I think chervil has a pretty different flavor--more floral and less sharp than parsley. 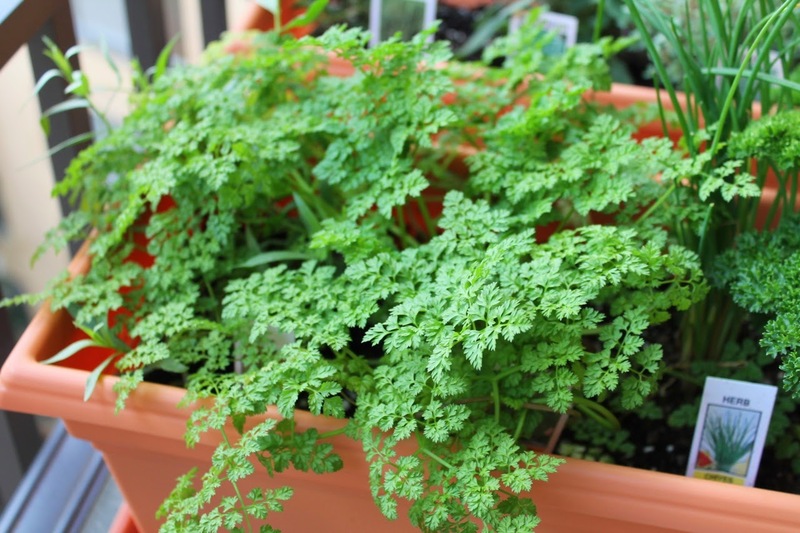 Lacking chervil, which I've never been able to find in a grocery store or farmer's market (hence my desire to try growing it), you could substitute fresh parsley. 1. Bring 1 1/2 cups water to boil in a medium saucepan. Add barley, cover and reduce heat to simmer for 40 minutes. Remove lid and set aside. 2. Heat a Dutch oven over medium heat. Add bacon and cook until crisped. Remove bacon from pot with a slotted spoon and set aside. Remove any bacon fat from the pot in excess of about 2 tablespoons. Add the onion, carrots and garlic and cook until softened, about 10 minutes. Add the mushrooms and cook until browned, about 5-7 minutes. Add the kale and cook about 2-3 minutes until it begins to wilt. Add the chicken broth, thyme and bay leaf and increase heat to medium-high to bring to a boil. Add the corn, cooked bacon and cooked barley and reduce heat to medium. Simmer for 10-15 minutes. Turn off the heat. 3. Mix arrowroot powder with 1 tbsp. water to create a slurry then stir into the pot. Add the vinegar and cream and stir to combine. Serve in bowls topped with a sprinkle of fresh chervil. I could eat this soup every day, without complaint.